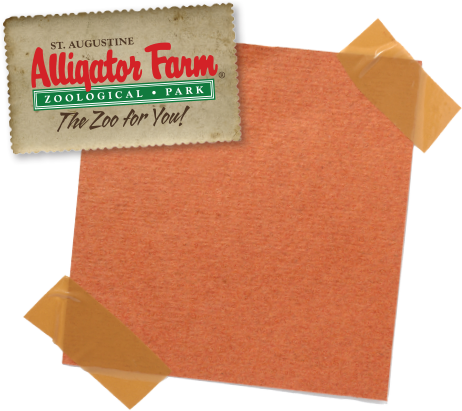 Thrilling discoveries await you at the St. Augustine Alligator Farm Zoological Park! Prepare for your next adventure by exploring the links on this page. You can purchase tickets online, simplify your group visit with our helpful tips, or begin planning your special event with our party and zoo rental options. Teachers, be sure to utilize our Teacher Resources to make your next field trip a successful educational expedition. We’re open every day from 9am to 5pm. Extended summer hours from 9am to 6pm. Get your ticket to adventure! You’re about to venture into the exotic realm of awe-inspiring crocodilians, breath-taking birds, and playful primates at The St. Augustine Alligator Farm Zoological Park! You can purchase your tickets ahead of time online. Just click here and print your tickets at home, or present the confirmation barcode on your smart phone when you arrive. It’s easier than spotting a crocodile in a lagoon full of alligators, and you’ll save a dollar on each ticket!